June 14, 2016, marked the 10-year anniversary of the beginning of a popular uprising in the southern Mexican state of Oaxaca. The Oaxacan social movement of 2006 formed following the violent eviction of striking teachers from their labor union’s encampment in the zócalo (main plaza) of Oaxaca City. Outraged by the use of force against peaceful protesters, thousands of fellow Oaxacans flooded the streets of downtown Oaxaca in support of the teachers and to condemn the repression ordered by then-governor Ulises Ruiz Ortiz. In 2006, anti-authoritarian sentiment galvanized a wide cross-section of Oaxacan society to mobilize, forcing the police to retreat as the people reclaimed the symbolic and material center of the city—the zócalo. Soon after reclaiming this key space, over 300 organizations and existing social movements united to form a broad-based movement, which maintained grassroots control of the city for nearly six months. Almost 10 years to the day that Governor Ruiz ordered the violent eviction of teachers from the zócalo, Oaxaca’s teachers are again on strike and again the government’s response is not negotiation, but repression. At the national level, teachers from the dissident wing (CNTE) of the National Teachers Union (SNTE) have been protesting the neoliberal education reforms of President Enrique Peña Nieto since 2013. More recently, CNTE activists have gone on strike, set up encampments, and mobilized their base in Chiapas, Guerrero, Mexico City, Puebla, Oaxaca, and throughout the country since May 15, which is National Teachers’ Day in Mexico. In response to the protests, Peña Nieto’s government has mobilized its security forces, which have grown exponentially over the past decade thanks in large part to billions of dollars in military aid from the United States. Federal police have been arriving in Oaxaca by the hundreds, as well as in other states with a heavy presence of CNTE, which not coincidentally tend to be the poorest and most indigenous states in Mexico. The police have also arrested key leaders of the teacher’s union in recent days on what many feel are trumped-up charges. 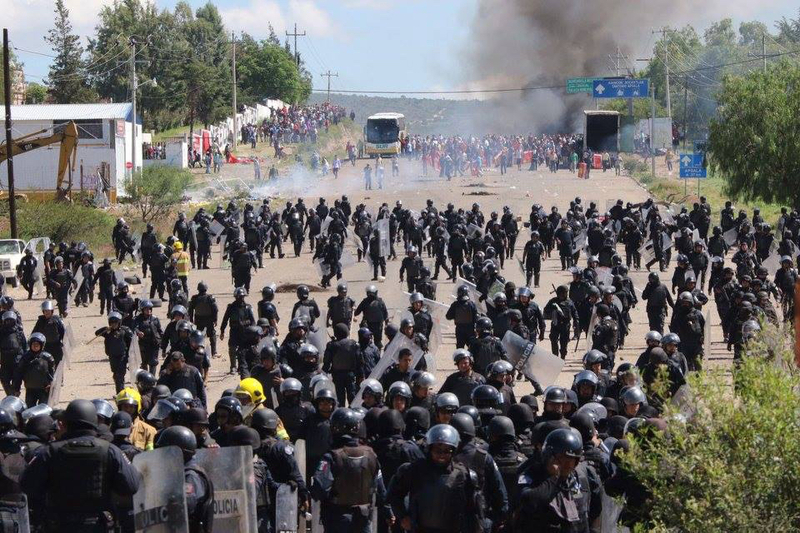 The latest and most violent attack against the teachers came on June 19 in the town of Nochixtlán, located about an hour outside the capital city of Oaxaca. Federal and state police opened fire on teachers and their allies who were defending their barricades, which blocked the federal highway connecting Oaxaca with Mexico City. The latest accounts put the number of dead at 8, with 108 injured, 22 arrested, and 7 disappeared. Although the current protests are, understandably, often reported as occurring solely between teachers and police, it is important to note that although the teacher’s union is at the core of the mobilizations, youth and other sectors of civil society form a significant part of the growing resistance against the government—much like they did in 2006. This fact is tragically reflected in the list of the dead from Nochixtlán, which includes 19-year-old Jesús Cadena and 22-year-old Óscar Nicolás Santiago. In the aftermath of the attack in Nochixtlán, the Mexican and Oaxacan governments scrambled to address the loss of life. Initially, government spokespeople denied that police were carrying live ammunition and blamed the deaths on yet to be identified “third party radicals.” Faced with growing evidence collected by journalists and civilians on the ground that shows police firing their weapons, the government was forced to admit that their security forces were indeed armed with live ammunition, though they still blame “outside groups” for the violence. In Oaxaca, many of the networks that were created in 2006 have been reactivated in response to the latest aggressions by the government. Self-defense barricades have been erected in the capital city, as well as in communities throughout the state to prevent, or at least impede, security forces from circulating. Cultural events have been organized in the zócalo and throughout the city center as a display of solidarity with the teachers and to show the government that the people will not be intimidated into silence. Vigils for the dead have also been planned throughout the United States. Public declarations condemning the violence and calling for the government to sit down to negotiate with the teachers have been mounting. Due to this national and international pressure, Peña Nieto’s Secretary of State Miguel Ángel Osorio Chong announced a meeting with teacher’s union leaders to be held on June 22. Peña Nieto himself addressed the violence through a series of tweets, in which he lamented the loss of life, but characteristically stopped short of holding himself, his cabinet, or his police forces accountable. Although reports in US media seem to indicate that the police are pulling back, history shows us that we must be highly critical of the Mexican government’s actions. We must remember that this is the same government whose approach to human rights has been described by Amnesty International as “hide or ignore the facts and hope for accusations to go away.” The same government has been roundly implicated in the forced disappearance of 43 students and the extrajudicial killing of three more from Ayotzinapa teacher’s college in the state of Guerrero. Its indifference to feminicide was tragically laid bare with the murder of six women every day. The same government has occupied power while thousands of Mexicans have disappeared and hundreds of thousands more have been murdered. It has allowed Mexico to become one of the most dangerous countries in the world for journalists—a fact we are reminded of with the death of reporter Elpidio Ramos Zárate, who was killed while covering the violent eviction of teachers in Juchitán, Oaxaca, on June 19. It may be tempting to place blame for these ongoing atrocities solely on the other side of Donald Trump’s border wall, but we must also remember that the people committing these crimes are being funded, trained, and armed by the US government through the Mérida Initiative. Amnesty International argued back in 2008 that the agreement, which was meant to help the Mexican government combat drug cartels, did little to ensure human rights and failed to address the level of impunity and corruption that has “essentially penetrated all political parties and most institutions” in Mexico. So although Congress recently decided to give Mexico a slap on the wrist for its shameful human rights record by withholding $5 million of the multibillion aid package, we must do more to hold our elected representatives accountable for continuing to fund Mexican security forces amid the overwhelming evidence that they are part of the problem, not the solution. * Maurice Rafael Magaña is Assistant Professor of Mexican American Studies at the University of Arizona and a Program Representative at the UCLA Labor Center. He is currently working on a book manuscript entitled “Cartographies of Resistance: Youth Mobilizing Hip-Hop, Punk, and the Production of Counter-Space,” which focuses on the role of youth organizers in the Oaxacan social movement of 2006. He is also author of the forthcoming book, “Mike Garcia and the Justice for Janitors Movement,” published by the UCLA Center for Labor Research and Education. He can be reached at mmagana0512@gmail.com.